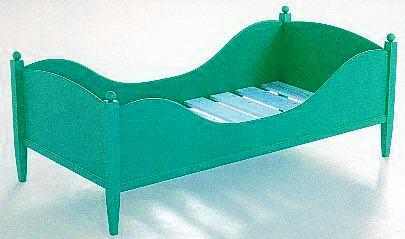 These painted beds offer the best in contemporary colouring and styling. If you click on the links you can see several different colours for each bed. A truly amazing display of colour and design. Stencilling could also be used to good effect on these beds. 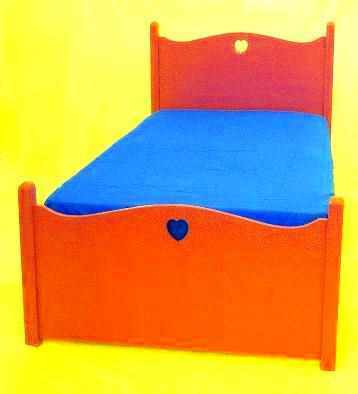 We can supply these beds in unpainted MDF, for you to paint yourself ( they require some final sanding off ), or for a set price we will supply them painted to any colour match you require. These beds look great with a top sheet in a single complimentary colour. All of the beds require some home assembly ( quite straight forward but easier with two of you ). 1/ Beds 1, 2 & 3 are all part of the same range. The basic choices are 1/ sleigh style, 2/ sofa bed style or 3/ bunkbed, and you can mix elements between them. The head and foot boards are the same for the three types. The sleigh bed shown here has lovely flowing side rails. Ht 30". The 3 beds all take a 6'3" x 3' mattress ( 1905 x 900mm ). Slats are included. 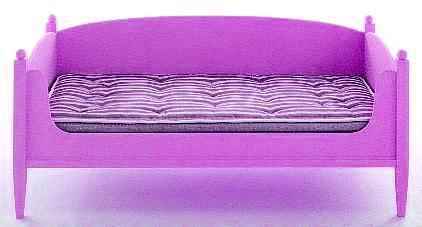 2/ The sofa bed style has a high back and wider opening front ( you could use these on the bunkbed as well ), and looks great with lots of cushions. It is almost Scandinavian in it's style, and we have shown it in several paler Scandinavian colours. Perfect where space and style are at a premium, the bed doubling as a sofa. Sizes, details and price as 1/. 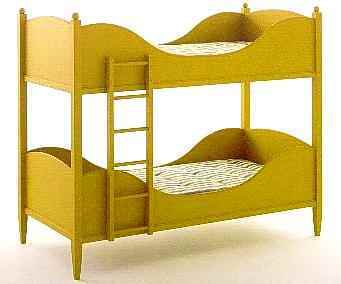 3/ This is probably the most stylish bunkbed you will find. It creates a wonderful elegant presence, very practical and can match your interior colour scheme perfectly. This bed does not 'break down' into 2 separate singles ( for rigidity with children ), but we could probably do this if required. Ht 69" / 1750mm. Can be supplied unpainted, or painted in a colour of you choice. Painted a single colour. Made to order. 4/ This painted bed is based on an Arts & Crafts original by CFA Voysey. It is very similar to the above designs, with 'heart' cut-out designs at either end. It takes a single mattress 6'3" x 3' mattress ( 1905 x 915mm ). Slats are included. Price POA. Delivery time approx. 10 - 12 weeks for the unpainted bed. You could also use this as a bedstead frame around a divan base. 5/ This is the reproduction we did of Vincent Van Gogh's own painted bed, which you can see by clicking the link on the bed index page. We have shown it in several colours on the 'More Beds' link below, so you can choose the colour that you prefer. 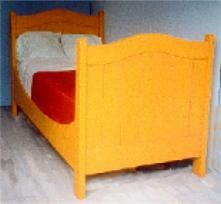 The bed can be supplied as a single, double or kingsize. This is a big solid bed that makes a great impression, full of contemporary country style. It can be suppied with flat MDF panels for the head and footboards, or with tongue & groove panels as the original.